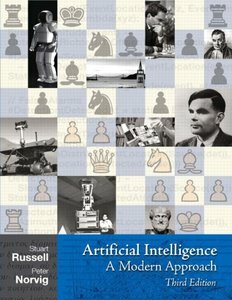 Stuart Russell, Peter Norvig, "Artificial Intelligence: A Modern Approach (3rd edition)"
Artificial Intelligence: A Modern Approach, 3e offers the most comprehensive, up-to-date introduction to the theory and practice of artificial intelligence. Number one in its field, this textbook is ideal for one or two-semester, undergraduate or graduate-level courses in Artificial Intelligence. Dr. Peter Norvig, contributing Artificial Intelligence author and Professor Sebastian Thrun, a Pearson author are offering a free online course at Stanford University on artificial intelligence. According to an article in The New York Times , the course on artificial intelligence is “one of three being offered experimentally by the Stanford computer science department to extend technology knowledge and skills beyond this elite campus to the entire world.” One of the other two courses, an introduction to database software, is being taught by Pearson author Dr. Jennifer Widom.